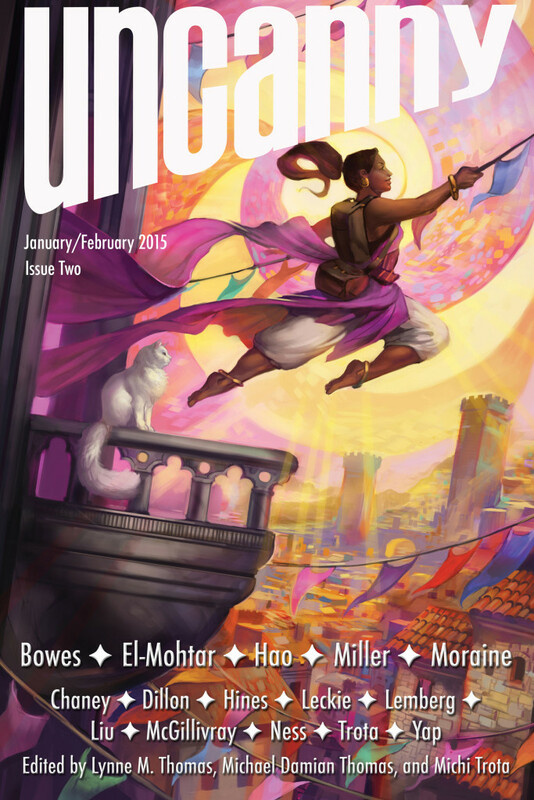 It’s fitting that my first post of 2015 should be about Uncanny: A Magazine of Science Fiction and Fantasy. Being the magazine’s managing editor has so quickly become such a big part of my life, and it’s a safe bet that Uncanny Magazine is going to dominate much of the coming year. This is by no means a bad thing. I’m incredibly proud of Uncanny Magazine, and the amazing team behind the magazine is an absolute pleasure to work with. The hardest thing about being part of Uncanny Magazine is having to wait for each issue’s release to share the fantastic fiction, poetry, and nonfiction with everyone – one of the best things about being an editor is getting to see all that amazing prose and poetry first, and seeing how much people enjoy that work is even better. Issue Two continues the high standard set by Uncanny Magazine’s debut and raises the bar that much higher. “Folding Beijing” by Hao Jingfang completely blew me away – the first time I read it, I knew we were going to share something special with Uncanny‘s readers. At 16,000 words, “Folding Beijing” is more of a novelette than short story, but Hao’s narrative deftly weaves issues of class mobility and economic struggle with poignant character relationships, all set to a stunning visual backdrop that would put Inception to shame. And Amal El-Mohtar’s “Pockets” is the kind of story that reminds you just how wonderfully weird life can be, and of the unexpected connections we can find with others. El-Mohtar wrote something that is whimsical and deeply moving at the same time, and it’s a story I’m going to read when I need a reminder that we are connected in more ways than we can imagine, and that there can be meaning, even in the most random occurrences. Don’t forget to listen to Episode 3 of the Uncanny Magazine Podcast (January 6), including: Editors’ Introduction, Sam J. Miller’s “The Heat of Us: Notes Toward an Oral History” (Read by C.S.E. Cooney), Isabel Yap’s “After the Moon Princess Leaves” (Read by Amal El-Mohtar), Interview with Sam J. Miller conducted by Deborah Stanish. Miller’s story packed a hell of an emotional punch when I read it, which was only magnified by Cooney’s reading. Uncanny Magazine has really been my first exposure to audio fiction, and given how much I’ve been enjoying it, I have to wonder what took me so long to give it a try. This issue, however, is near and dear to my heart, because it’s the first issue of Uncanny Magazine where I’m not only the managing editor, I’m a contributing essayist as well. “Age of the Geek, Baby,” explores the notion of “nerds as a socially oppressed class” – regardless of if they have social privilege by being white, heterosexual, cisgender, male, able-bodied, etc. – and what that means for nerds who are social minorities who experience both systemic discrimination and individual instances of bigotry. It’s a topic I’ve been thinking about for a very long time, and I’m grateful that Uncanny Magazine is where that essay found a home. The idea that nerds—regardless of intersecting axes of social privilege—are an oppressed social minority on a similar scale to POC, women, LGBTQ people, and other marginalized groups short–circuits our ability to openly discuss the problems created by systemic bias and discrimination within geek culture, not to mention our ability to fix those problems. It makes our silence seem normal, so that when we share our perspectives, the distorted view is that we’re trying to dominate the conversation, when we’re just trying to be heard. When we’re told that geek culture used to be a safe place where (mostly straight white cis male) nerds could escape the confines of traditional masculinity and social convention, it elides the fact that for many of us, being around other self–professed geeks and nerds was never actually “safe” to begin with. “Nerd entitlement” has been a hot topic (again) of late, so I hope you’ll give this a read. This entry was posted in Culture, Fandom and tagged marginalization, nerd entitlement, oppression, social privilege, Uncanny Magazine by Michi Trota. Bookmark the permalink.